SOUTH BEND, Ind. (AP) — Wide receiver Miles Boykin had a message for quarterback Ian Book after No. 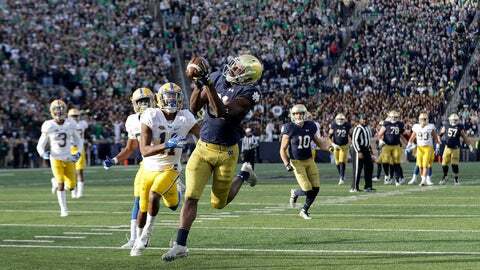 5 Notre Dame remained unbeaten, coming from behind and then holding off Pittsburgh. “I told him winning is fun, but let’s not win like this again,” the 6-foot-4 Boykin said after he caught the game-winning, 35-yard touchdown pass from Book with 5:43 remaining in the fourth quarter Saturday to secure the 19-14 win. Pat Narduzzi’s Panthers were looking to upset a top-five team for the third straight season after knocking off No. 3 Clemson in Death Valley during the 2016 season and No. 2 Miami last November in Pittsburgh. Kenny Pickett was 19 for 28 for 126 yards, and was sacked by Khalid Kareem — Notre Dame’s only sack of the game — for a loss of 14 yards on Pitt’s final possession to set up a fourth-and-long the Panthers could not convert. Pitt also ran a strange faked punt, inserting third-string quarterback Jeff George Jr. as the punter and having him throw, on its second-to-last drive around midfield that failed.